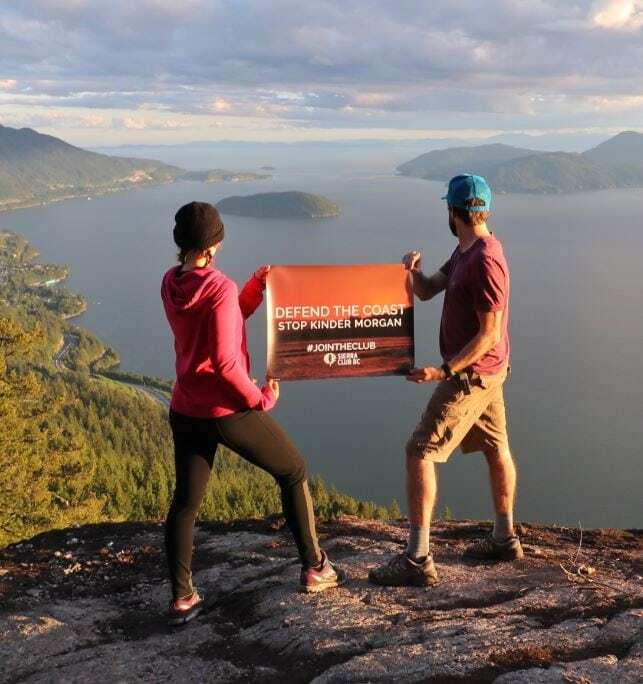 You helped stop the Trans Mountain pipeline and tankers in the courts! On August 30, we celebrated a major victory as the project’s approval was quashed by the Federal Court of Appeal. This court ruling is fantastic news for orca whales, for our climate, for Indigenous peoples defending their title and rights, and for the rights of all of us to defend the land and waters we love and call home. 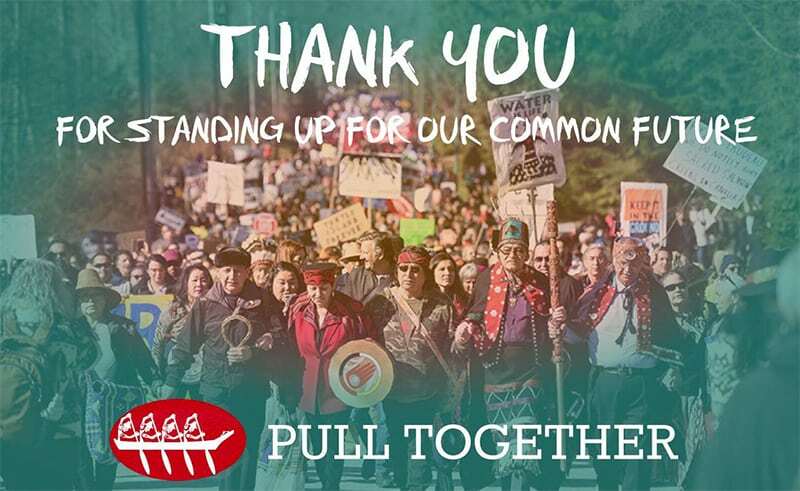 And it happened in part thanks to the help of hundreds of people who stepped up in solidarity with First Nations by supporting our Pull Together campaign. With your help, we raised more than $650,000 for the nations fighting this project in court! Take a moment to pat yourself on the back. First, we sent Kinder Morgan home to Texas, because the company knew this project was a sinking ship. Now, with your support, Indigenous peoples fought back – and won. The court agreed with what we’ve been saying all along: that the National Energy Board review was deeply flawed and fell far short of the mark in consulting Indigenous peoples. The fact that the NEB decided not to include in its review the impacts of marine tanker traffic– which it agreed would pose significant adverse effects to endangered orca whales – meant the government could not rely on the Board’s recommendation in making a decision. And because Canada failed to engage meaningfully with Indigenous peoples, the court ruled this consultation needs to be redone. This is a stunning blow. And it offers the perfect opportunity for Prime Minister Trudeau to walk away from this pipeline and tankers. But instead, he’s already doubled down his efforts to push this dangerous project through communities that do not consent. Trudeau has asked the NEB to reconsider its recommendations – and he’s given it an incredibly tight 22-week timeline to do so. To make matters worse, this hasty new review is already showing signs of the same flaws that were present in the original review. On September 26, the NEB announced the new review. We did some digging and found out the NEB was misinforming people about this process. We found that their website contained inaccurate and conflicting information, leading many people to believe that the deadline for comments on the project was October 3 – less than a week away. It also suggested people need to send in an application to participate and prove that they are “directly affected” or have “relevant information or expertise,” just like the first NEB review process in 2014, which was designed to shut people out of the process. After we pestered them all day, the NEB finally updated their website to correct the wrong info. It doesn’t look like the NEB has learned much from their past mistakes. Instead, it looks like they’re up to their old tricks and that we’ve got another sham process on our hands – a process destined for another predetermined outcome. This is what happens when you do a rush job. We see no difference yet between this and Harper’s approach – they’re still trying to confuse people and deny participation. If the Trudeau government takes its commitment to reconciliation and the United Nations Declaration on the Rights of Indigenous Peoples seriously, then these rigged and superficial approaches need to become a thing of the past. Indigenous peoples have the right to free prior and informed consent – and they still do not consent. It’s time for a more modern, democratic process that involves much closer scrutiny, especially of the many environmental, social and economic dangers posed by projects like this. We are thrilled that the courts have overturned federal approval of this dangerous pipeline and tankers project that would have put so much at risk. But the fight is far from over. We’ll be helping people ensure they are heard in this new process, and keeping a sharp eye on the NEB to ensure they don’t keep pulling more tricks. It’s still important to use this opportunity to raise your voice, and we hope you’ll participate by sending a letter of comment. Once more details are released on the process, we’ll be in touch about how you can have your say. Say yes to orcas and salmon – donate now to help us keep fighting this pipeline and oil tankers.